A 1.2km length of the River Avon, to the north of Salisbury, displayed all the classic habitat degradation features associated with post war river engineering – heavily impounded by a downstream relic sluice structure, over-wide, heavily silted and with a sand-impacted bed. All of which had led to a loss of habitat and species biodiversity along this internationally important chalk river. This stretch of the River Avon has been immortalised by the author Frank Sawyer, and is still to this day managed as a fishery for the Services Dry Fly Fishing Association (SDFFA) as it was during Frank’s time when he was the riverkeeper. Unfortunately, the degradation of chalk river habitat continues to be a problem within this catchment, as it was during Frank’s time. Degradation that in part can be associated with the presence and on-going use of historic water meadow structures (i.e. referred to as sluices or hatches in this part of the world). Hoping to restore a once popular wild trout fishery, SDFFA commissioned us to investigate the reasons for deterioration along the 1.2km reach and to design and construct a solution to re-energise the river and restore the degraded ecosystem. 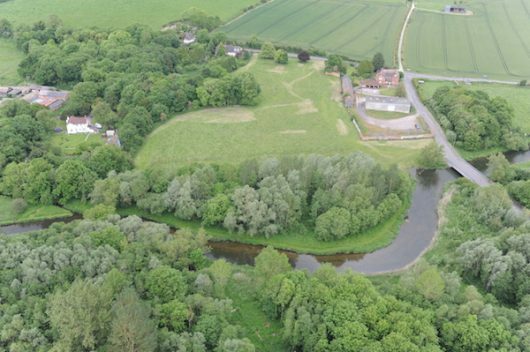 In doing so it was also hoped the work would also help to deliver Natural England’s target of achieving ‘favourable condition’ for the river, which is designated as a Special Area of Conservation (SAC) and Site of Special Scientific Interest (SSSI). Over-wide channel – lateral erosion of the banks of the Avon had over-widened the overall channel cross-section, causing flow velocities to be reduced resulting in the deposition of fine sand and silt on the bed, obscuring the gravels beneath. Poor flow variability – lack of flow variability and hydraulic scour had led to a very uniform river bed. Impounded flow conditions – a section of deep, slow-flowing water was observed a short distance upstream of a sluice structure (Gunville Hatches). 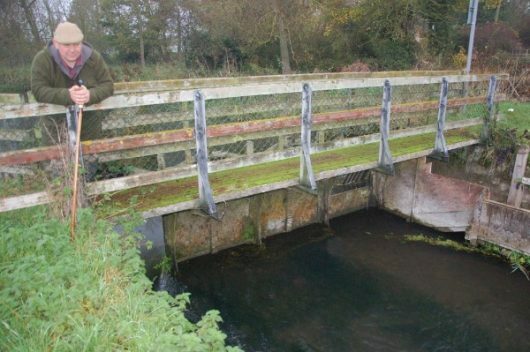 The sluices had been used historically to maintain artificially high water levels for stocked trout and, in more recent years, to facilitate the easy passage of cut Ranunculus weed downstream from the upper channel. The effects of impoundment are clearly deleterious to the health of the river in the form of very slow flows and heavy sediment accretions. Previous river restoration works have been undertaken along this stretch and while initially successful in delivering a re-energised river system for a few years, they often rapidly revert to their original status unless the appropriate restoration techniques are employed. The client was therefore keen to ensure the scheme would be durable enough to deliver a long-term solution. Through our work on the nearby successfully restored reach at Chisenbury. We were able to demonstrate to the client that degraded channels can be significantly improved using a combination of tried and tested techniques. introduction of complex flow patterns and sub-surface cover via the extensive use of mature site-won trees such as Alder and Willow. The completed work has had a very positive and dramatic impact on the river. The narrowing berms re-energised flow which has remobilised deep silt deposits and exposed the clean gravel bed beneath. Woody debris and hinged trees have scoured the bed creating deep pools and kicking up gravels to form new gravel riffles. This improved morphology has provided the right conditions for Ranunculus to regrow and flourish within the reach. Initially the very downstream end of the reach was still impounded, due to the impact of the now significantly reduced structure at Gunville, as the stanchions had to be retained, which was still causing some constriction to flow. These were finally removed in 2015 during an Environment Agency funded project.